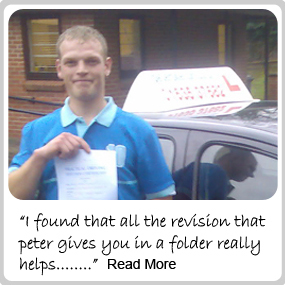 One of the reasons that we are successful as a driving school is that we believe the best way to learn to drive is to simply drive. We find that much of the tuition can be done on the move. Think about a child and how they learn to walk. Does the parent sit down and explain the mechanics of walking to their child? Do they talk about the safety aspects of walking? Do they talk about the legalities of walking i.e. trespassing? The answer to all these questions is simply “No”. They hold the child’s hand and they guide them and praise them as they take their first steps until the child manages to do it for themselves. We take the same approach to teaching our pupils to drive. That is not to say that there won’t be any time sitting on the side of the road while we have to explain some things, however that will be kept to a minimum. It also doesn’t mean that we will just sit there and watch you crash. We will offer the necessary guidance depending on your level of ability. Some pupils even manage to learn a manoeuvre as well on their first lesson. The above is a typical example of what can normally be achieved. The amount any pupil achieves is dependant on their natural ability. Those with better than average natural ability will achieve more than others on their first lesson. We can not guarantee that you will always drive within 10 minutes on your first lesson. The reason for this is dependant on where we pick you up from. Where we pick you up from may well be an unsuitable place to start the first lesson due to how busy the roads are. Therefore your instructor may well have to drive you to a quieter spot. As they do so they will be talking to you about what you are going to learn and asking you what you already know about driving. However we do make it our target to get as many pupils as possible driving within 10 minutes on their first lesson.